This post is sponsored by Uplands Cheese. As always, all thoughts and opinions are my own. Thank you for supporting the brands that support Midwest Foodie! The secret to getting this Sunday night dinner worthy meal on the table any day of the week is that you don’t boil the pasta! Save yourself the time and hassle of boiling the noodles and just fill them uncooked. 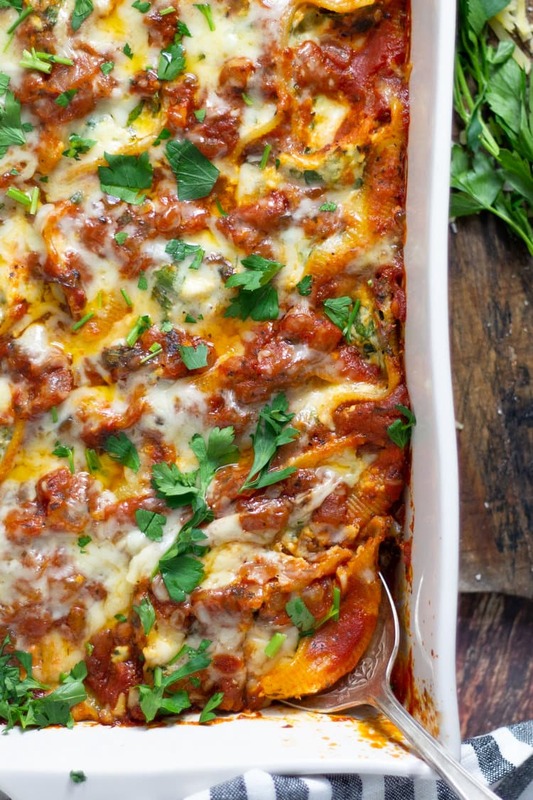 Nestle them in classic tomato sauce, top with shredded cheese and bake to al dente perfection in the oven! So wait, I don’t boil the noodles? Exactly! The moisture from the red sauce and a little splash of water are going to cook the jumbo shell noodles to al dente perfection right in the baking dish! This means you don’t need to fill a pot with water, wait for the water to boil, cook the noodles or strain the noodles. It also means that you won’t have to try to hang on to slippery noodles and somehow magically fill them with the cheesy spinach filling. Uncooked noodles are obviously much easier to hold and fill – so you’re welcome! 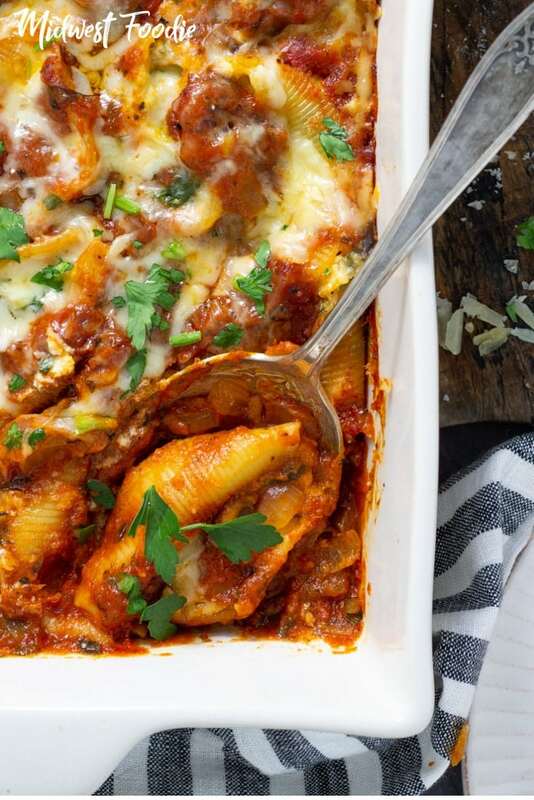 How do I make stuffed shells without boiling the noodles? I’ts easy! You just fill uncooked jumbo shells with a cheesy ricotta and spinach filling and then nestle them into your jazzed up store bought sauce (more details on the jazzing below). Then you’ll cover the baking dish with tin foil to ensure that the stuffed shells get perfectly tender while they bake in the oven. What kind of sauce should I use? This recipe is all about the cheese! Jazz up your favorite store bought spaghetti sauce by adding your leftover Pleasant Ridge Reserve cheese rinds and some fresh chopped herbs. 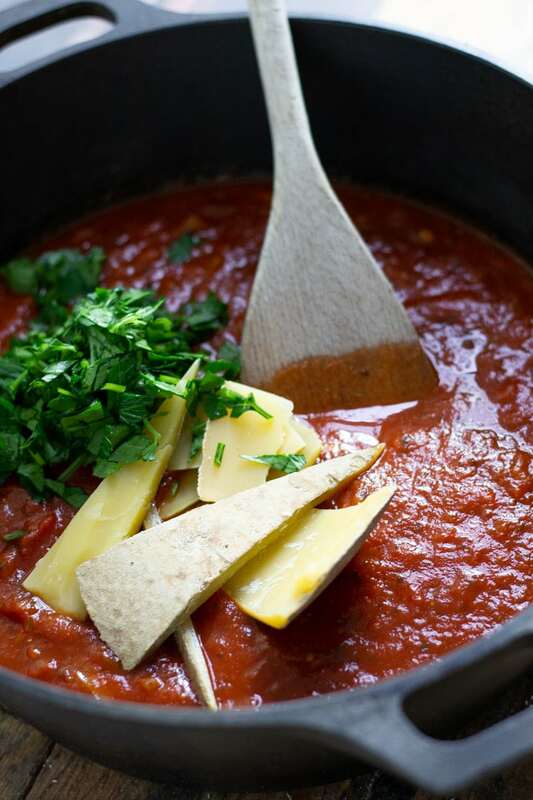 As the sauce simmers, the cheese rinds will soften and impart the most delicious, deep, rich flavor into the sauce. This is a great way to make a store bought pasta sauce taste like it’s homemade – and like it’s been cooking all day! The most perfect melty and flavorful cheese that I’ve found is Pleasant Ridge Reserve from Uplands Cheese in Dodgeville, Wisconsin. 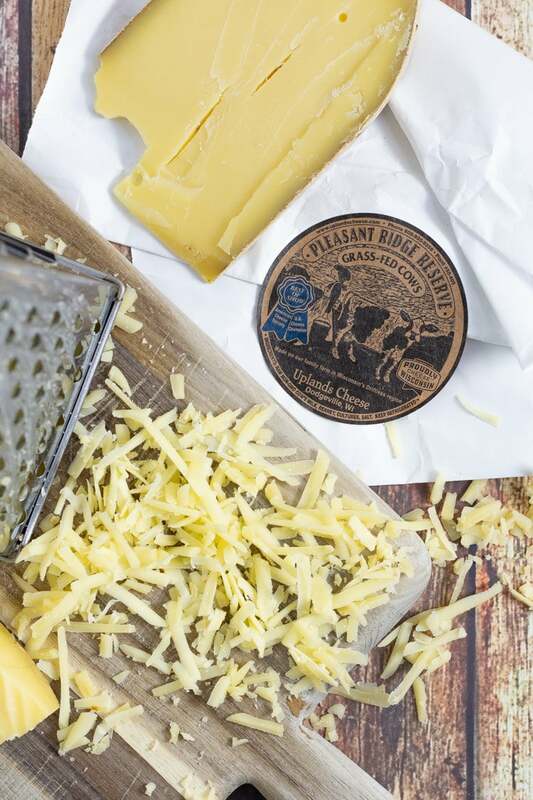 Not surprisingly it’s the most awarded cheese in American history – and after you’ve had your first bite, you’ll see why. It’s only made from May through October, during which time the cows are eating fresh pasture which produces the most amazing flavored cheese ever! Where can I find Pleasant Ridge Reserve? Luckily, Uplands Cheese products are available all across the country! Check out their store locator for retail locations near you. If you’d like their cheeses delivered right to your home, they ship anywhere in the U.S. too! And if you’re in need of a unique holiday gift for that special cheese lover in your life, make sure you check out their gift boxes also! 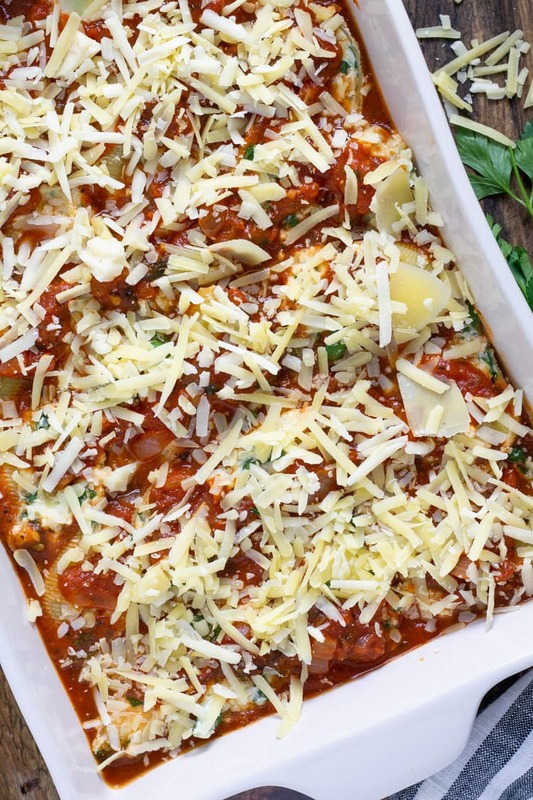 Can I make these stuffed shells ahead of time? Yes! Follow the recipe directions and before baking, cover the dish with plastic wrap and pop it in the fridge for up to a week! Whenever you’re ready to bake the stuffed shells, let them sit out on your counter for about an hour so they come to room temp. Then bake according to recipe directions and enjoy! Don’t worry if it looks like a lot of sauce. The moisture from the sauce is going to cook the noodles right in the oven, so you’ll need a lot of sauce. Feel free to make these shells ahead of time and store them in your fridge until you’re ready to bake. Let them sit out on the counter for about an hour so they can come to room temperature before baking. Shred your own cheese. Buy a block of cheese and shred it yourself! Pre-shredded cheeses are coated with cellulose to help the shreds not stick together. Which also means that it won’t melt as well. I’ve often found that buying cheese in blocks is cheaper than pre-shredded too! 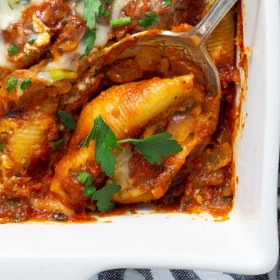 The secret to getting this Sunday night dinner worthy meal on the table any day of the week is that you don’t boil the jumbo shells! Heat olive oil in a large pot over medium heat. Add onion along with a pinch of salt and pepper and saute for 3-4 minutes, stirring frequently. Add garlic and saute for another minute or so. Stir in oregano, sage, spaghetti sauce, cheese rinds, 2 tablespoons fresh chopped parsley and another couple pinches of salt and pepper. Cover and simmer sauce over low heat for 30 minutes, stirring occasionally. 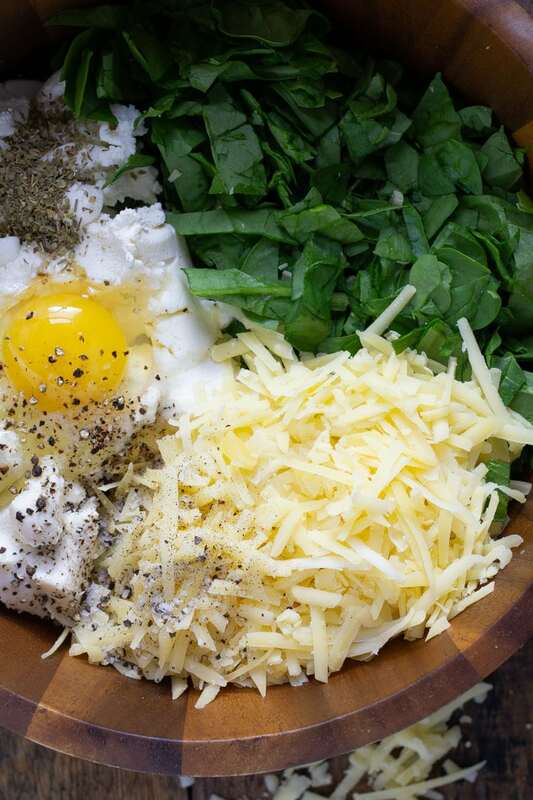 While the sauce is cooking, in a large bowl combine spinach, ricotta, about 2/3 of the shredded cheese, egg and a pinch of salt and pepper. Fill uncooked jumbo shells with a couple tablespoons of filling each. 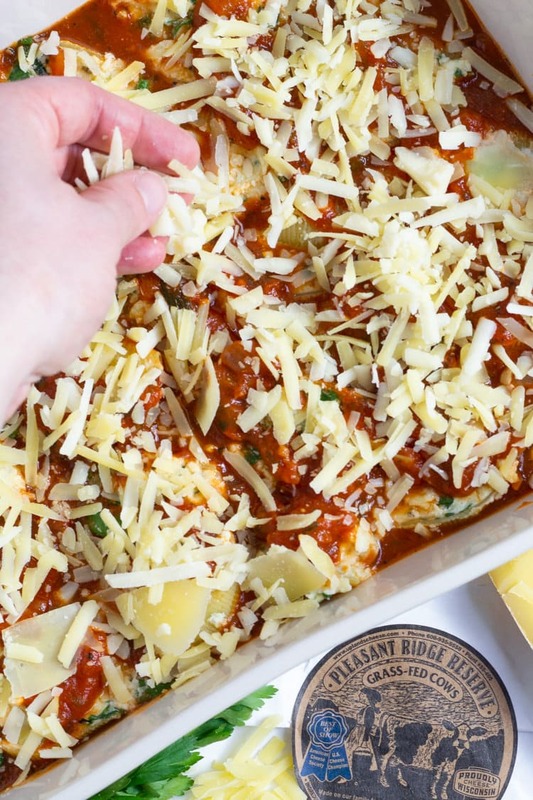 Once the sauce has simmered, carefully remove cheese rinds. Then pour 3/4 of the sauce into the bottom of a 9×13 baking dish. 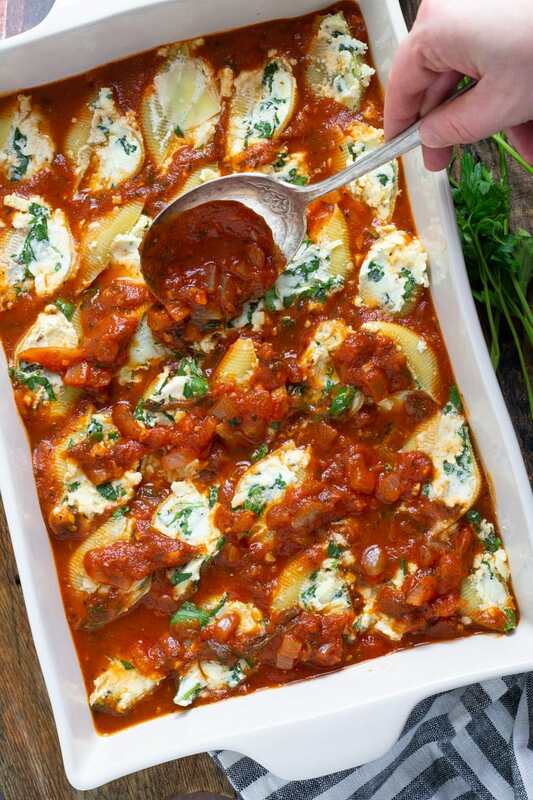 Nestle stuffed jumbo shells into the sauce in a single layer. Top with remaining sauce and cheese and cover with tin foil. Bake for 50 minutes or until noodles are al dente. Broil on high for 1-2 minutes until the cheese gets golden brown. Garnish with fresh chopped parsley and enjoy!